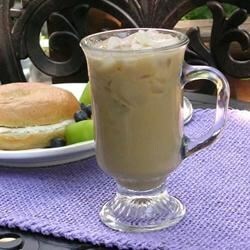 "Wonderful iced coffee just like Tim Hortons®. Perfect for hot summer days." Refrigerate coffee until cool, about 30 minutes. Chill four glasses, if desired. Stir vanilla extract and sugar in the boiling water until dissolved. Refrigerate until cool, about 30 minutes. Divide the ice and chilled coffee evenly between the four glasses. Stir in cream and sugar mixture, to taste. This was way too sweet for me. Or maybe this is an acquired taste that I just don't have. This is great! I added a splash of chocolate and it was perfect. Thanks for the recipe!